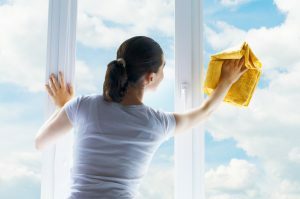 What is it about cleaning windows that most people don’t like? Is it the special equipment? The heights? The repetitive motion? Whatever it is, window cleaning is one of those jobs that most homeowners will hire somebody else to do for them. Even many cleaning services refuse to clean windows. But not Posh Home. In fact, we love cleaning windows … especially those in your home! Window Cleaning Highland Beach — Yes, We Do Windows! Cleaning windows is one of those projects that many homeowners will try on their own once before deciding that it’s simply too much work. Most people discover that their homes have a lot more windows than they thought, especially when they have to clean them all! And windows have to be cleaned on both sides — the interior and the exterior — to look really clean. It’s almost become a cliche: Maids telling their employers that the “don’t do windows”. So what is it about window cleaning that is so difficult? For one, it takes time. And many maid services want to get in and out so that they can service as many clients in a single day as possible. For another, cleaning windows requires specialized equipment, especially exterior windows on upper floors. Most maid service companies are hauling around things like telescoping poles, special squeegees, and other window cleaning gear. Window Cleaning Highland Beach — Call Posh Home! If you don’t want to clean your home’s windows yourself and your current cleaning service won’t do it, we have a solution. Posh Home specializes in both interior and exterior windows on homes of all sizes. Even if you don’t use our regular cleaning service, we can still accommodate your window cleaning on a one-time or regular basis. Simply call Posh Home today for your FREE estimate. Simply call Posh Home today for your FREE estimate.